MEZCLA JAZZ DVD! 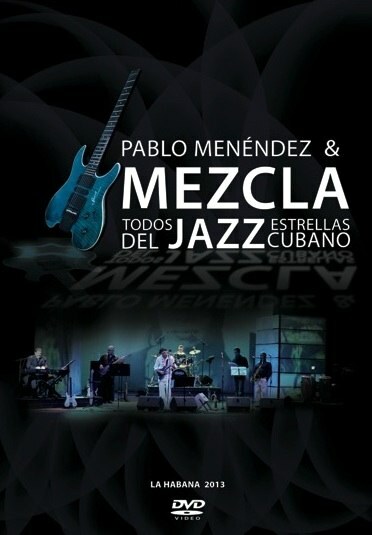 Released January, 2014 Live Concert Pablo Menéndez & Mezcla Todos Estrellas del Jazz Cubano Teatro Nacional, Havana, August 2012 PLUS: Documental “Pablo Menéndez: mucha mezcla” *Read Review on timba.com LINER NOTES: (pincha aquí para la versión en español) ￼Pablo Menéndez: A while back I decided that we needed to put on a concert here in Havana highlighting the jazz repertory that we were doing while out on tour at international festivals. When I thought about the fact that all the musicians that were part of the project also had their own bands or were A-list soloists, I said, “Wow! This really is an All-Star team!” So we decided to film it. The concert that is presented on this DVD, includes current members of Mezcla as well as others who have been members of our group in the past, along with several friends of Mezcla who have collaborated with us at various times in our history... There are many others who we were not able to include this time since we had to limit things to what was possible to achieve in an evening-length concert. It’s possible that music can’t solve all of the world’s problems but you can’t deny that it enhances our lives in an essential way. Truthfully, I have many reasons to be an optimist. I have a great job, surrounded by musical geniuses that each time we play together, share their incredibly creative improvisations. I hope that you enjoy their playing as much as I do. We could have kept playing for days. But there will always be more concerts and more recordings and DVDs (or whatever the next format is in the future…) I suggest that you don’t watch the concert alone: Get a group of friends together to watch it or share it with your family…. But if you are alone, try to imagine that you’re there with us on stage, part of our musical family and allow yourself to be spiritually nourished. After all that is what inspires us to play for you. Sincerely, -- Pablo Menéndez The songs are: 1. Hijos de la mezcla (Born of the Mixture) (author: Pablo Menéndez) I mixed electric guitar with bata drums to symbolize that all human beings are “sons of the mix” which is what makes humanity so marvelously beautiful and diverse. Octavio Rodríguez is featured here. He is one of the musicians who has been with Mezcla the longest. A master rumbero and a priest of the sacred bata drums of the Yoruba tradition, he was one of the first drummers who back in the 1970s perfected the art of playing all three bata drums together while also singing. I consider him a national treasure no just because of his role in conserving the complex anscestral rhythms but also because he has known how to mix them with all the different genres of present-day Cuban music as well as international styles. 2. Big Brecker (by Orlando Sánchez) A tribute to the great saxophone player and composer Michael Brecker. It mixes rumba with themes from a number by the Brecker Brothers’ band, which was a trailblazer for jazz-rock fusion in the 80s. Orlando Sánchez is one of Cuban jazz’s all-time greatest composers besides being a genius sax and piano player. For those who are only acquainted with Cuban music from 50 years ago, I present this composition as “an example of typical Cuban music" ;-) 3. El médico de los pianos (The Piano Doctor) by composer Jorge López-Marín is a tribute to a piano tuner --a North American Quijote-- who is a big friend of Cuba: Ben Truehaft, “El Médico de los Pianos” (The Piano Doctor). Ben earned this nickname and the affection of the Cuban people, due to his constant challenge to those who use prohibitions to divide our two neighboring countries: Cuba y los EE.UU. Jorge López-Marín composed this piece especially for Cuba’s Camerata Romeu. And their amazing director, Zenaida shared the chart with me, which I adapted to create this arrangement for Mezcla. 4. I'll See You In C.U.B.A. (author: Irving Berlín) In the 1920s the US banned the sale and consumption of alcohol. Composer Irving Berlín discovered the existence of some excellent rum 90 miles south of the Florida Keys and he wanted to get the word out with this song and the pun he used in its title. Now that drinking is legal again in the US, it turns out that our neighbors to the north are not allowed to come and visit us and have taste of that delicious rum! If they were forced to repeal that other prohibition, it has to be possible that some day we’ll be able to visit one another without so many problems! This song features a brilliant trompet solo by Máyquel González who shows off his deep knowledge of all styles of jazz. Ever since he graduated from Havana’s Instituto Superior de Música and started out as a professional musician with Mezcla, I have thought of him as, Mayquel "Mezcla" González. 5. ¿Quién tiene ritmo? (author: Benjamín Lapidus) American guitarist Ben Lapidus is one of the most important composers for the guitar in latin jazz. I love playing his pieces and this particular one is very special for me with it’s paraphrasing of the jazz standard, "I've Got Rhythm." On this number we feature Alexis Bosch, one of the greatest pianists of Cuba, a country that has an over-abundance of great jazz pianists. I have always loved his way of telling a story with every solo he plays. 6. Homenaje a Afro-Cuba (author: Máyquel González) Máyquel composed this piece as a tribute to the legendary jazz ensemble and also to the man who held the trumpet chair in Mezcla before he did, Roberto García. Robertico led Afro-Cuba during one of its richest periods and who is now musical director of La Academia. Robertico shares the flugelhorn solos on this cut. It is quite touching to hear the young master and his mentor playing together on this. 7. Suzi's Mood (autor: Edgardo Miranda) I got this piece years ago from my Nuyorican brother, Jerry González. Jerry has done more than most anyone in the world for latin jazz, or jazz with clave. He’s plays trumpet and congas and is the leader of the famous group Fort Apache Band that I appreciate for all the positve influence it has had. I really love this piece. We recently had the chance to play it here in Havana for its author, the Puerto Rican cuatro player and jazz guitarist, Edgardo Miranda. For this version we invited violinist William Roblejo, one of the endless supply of fine young Cuban jazz players on the scene today. 8. Chucho's Blues (author: Orlando Sánchez) We couldn’t leave out this tribute to one of the greatest jazz players of Cuba and the entire world: Chucho Valdés. And what an honor to have one board one of the former members of Irakere, current leader of Habana Ensemble, the master sax player, César López. 9. Chicoy's Blues (author: Orlando Sánchez) A tribute to one of the greatest Cuban jazz guitarists, Jorge Luis Valdés Chicoy, done in a style that I feel is my own, given that I am from Oakland, California --a place where there’s a lot of blues-- and given that the blues is one of the genres that my mother Barbara Dane sang the best. It’s a true luxury to have someone play on this who I consider one of the best bass-players in the world, my brother José Hermida. And our drummer Ruy López-Nussa contributed an amazing solo. He represents a dynasty of great Cuban jazz players who all share his last name plus he is the leader of the super group, La Academia. 10. Rumba a puertas abiertas (“Open Door Rumba,” author: Octavio Rodríguez) Some people think jazz is a music of the elites or “those in the know.” We wanted to end our concert with a rumba composed by Octabio Rodriguez that makes a point of inviting everybody in to have a good time, just like we do with all our our mixed-up Mezcla music and our varied repertory that is open to everything: trova, Cuban rock, Cuban jazz, rumba, Afro Cuban music: everything together, “todo mezclao” and “with the doors open.” ENCORE: 11. Cuando se vaya la luz, mi negra (“When the lights go out” autor: Frank Delgado) Here in Cuba we understand the philosophy of the blues: "al mal tiempo, buena cara”; "canta y no llores” and other typical Cuban phrases all refer to the idea of “laughing just to keep from crying.” This song really helped us face some dark and difficult years here in Cuba during the Special Period. And for me personally during this concert it helped me more than ever to handle some of the tough emotions that I was feeling throughout the night. The original author put his wife’s name in one verse asking her to “hand him a candle” and years ago, when I first started singing this song, I changed the name to personalize that intimate scene. So during this concert, when people heard me say that there was someone missing in the audience that night, everyone present knew that I was referring to the person who was my partner for over 44 years. She was an actress who was very well loved in all of Cuba and all of those of us who knew her were still feeling the pain of her recent physical disappearance. I was so emotional that when it came time to do this song, I don’t know how I was even able to play the guitar. I’m not a religious man and I don’t believe in ghosts, but that night I felt that she was right there with us on stage. And I know that Adria Santana will always be with me and will always be alive in my heart. A while back I decided that we needed to put on a concert here in Havana highlighting the jazz repertory that we were doing while out on tour at international festivals. When I thought about the fact that all the musicians that were part of the project also had their own bands or were A-list soloists, I said, “Wow! This really is an All-Star team!” So we decided to film it. The concert that is presented on this DVD, includes current members of Mezcla as well as others who have been members of our group in the past, along with several friends of Mezcla who have collaborated with us at various times in our history... There are many others who we were not able to include this time since we had to limit things to what was possible to achieve in an evening-length concert. It’s possible that music can’t solve all of the world’s problems but you can’t deny that it enhances our lives in an essential way. I suggest that you don’t watch the concert alone: Get a group of friends together to watch it or share it with your family…. But if you are alone, try to imagine that you’re there with us on stage, part of our musical family and allow yourself to be spiritually nourished. After all that is what inspires us to play for you. 1. Hijos de la mezcla (Born of the Mixture) (author: Pablo Menéndez) I mixed electric guitar with bata drums to symbolize that all human beings are “sons of the mix” which is what makes humanity so marvelously beautiful and diverse. Octavio Rodríguez is featured here. He is one of the musicians who has been with Mezcla the longest. A master rumbero and a priest of the sacred bata drums of the Yoruba tradition, he was one of the first drummers who back in the 1970s perfected the art of playing all three bata drums together while also singing. I consider him a national treasure no just because of his role in conserving the complex anscestral rhythms but also because he has known how to mix them with all the different genres of present-day Cuban music as well as international styles. 3. El médico de los pianos (The Piano Doctor) by composer Jorge López-Marín is a tribute to a piano tuner --a North American Quijote-- who is a big friend of Cuba: Ben Truehaft, “El Médico de los Pianos” (The Piano Doctor). Ben earned this nickname and the affection of the Cuban people, due to his constant challenge to those who use prohibitions to divide our two neighboring countries: Cuba y los EE.UU. Jorge López-Marín composed this piece especially for Cuba’s Camerata Romeu. And their amazing director, Zenaida shared the chart with me, which I adapted to create this arrangement for Mezcla. 4. I'll See You In C.U.B.A. (author: Irving Berlín) In the 1920s the US banned the sale and consumption of alcohol. Composer Irving Berlín discovered the existence of some excellent rum 90 miles south of the Florida Keys and he wanted to get the word out with this song and the pun he used in its title. Now that drinking is legal again in the US, it turns out that our neighbors to the north are not allowed to come and visit us and have taste of that delicious rum! If they were forced to repeal that other prohibition, it has to be possible that some day we’ll be able to visit one another without so many problems! This song features a brilliant trompet solo by Máyquel González who shows off his deep knowledge of all styles of jazz. Ever since he graduated from Havana’s Instituto Superior de Música and started out as a professional musician with Mezcla, I have thought of him as, Mayquel "Mezcla" González. 5. ¿Quién tiene ritmo? (author: Benjamín Lapidus) American guitarist Ben Lapidus is one of the most important composers for the guitar in latin jazz. I love playing his pieces and this particular one is very special for me with it’s paraphrasing of the jazz standard, "I've Got Rhythm." On this number we feature Alexis Bosch, one of the greatest pianists of Cuba, a country that has an over-abundance of great jazz pianists. I have always loved his way of telling a story with every solo he plays. 6. Homenaje a Afro-Cuba (author: Máyquel González) Máyquel composed this piece as a tribute to the legendary jazz ensemble and also to the man who held the trumpet chair in Mezcla before he did, Roberto García. Robertico led Afro-Cuba during one of its richest periods and who is now musical director of La Academia. Robertico shares the flugelhorn solos on this cut. It is quite touching to hear the young master and his mentor playing together on this. 7. Suzi's Mood (autor: Edgardo Miranda) I got this piece years ago from my Nuyorican brother, Jerry González. Jerry has done more than most anyone in the world for latin jazz, or jazz with clave. He’s plays trumpet and congas and is the leader of the famous group Fort Apache Band that I appreciate for all the positve influence it has had. I really love this piece. We recently had the chance to play it here in Havana for its author, the Puerto Rican cuatro player and jazz guitarist, Edgardo Miranda. For this version we invited violinist William Roblejo, one of the endless supply of fine young Cuban jazz players on the scene today. 8. Chucho's Blues (author: Orlando Sánchez) We couldn’t leave out this tribute to one of the greatest jazz players of Cuba and the entire world: Chucho Valdés. And what an honor to have one board one of the former members of Irakere, current leader of Habana Ensemble, the master sax player, César López. 9. Chicoy's Blues (author: Orlando Sánchez) A tribute to one of the greatest Cuban jazz guitarists, Jorge Luis Valdés Chicoy, done in a style that I feel is my own, given that I am from Oakland, California --a place where there’s a lot of blues-- and given that the blues is one of the genres that my mother Barbara Dane sang the best. It’s a true luxury to have someone play on this who I consider one of the best bass-players in the world, my brother José Hermida. And our drummer Ruy López-Nussa contributed an amazing solo. He represents a dynasty of great Cuban jazz players who all share his last name plus he is the leader of the super group, La Academia. 11. Cuando se vaya la luz, mi negra (“When the lights go out” autor: Frank Delgado) Here in Cuba we understand the philosophy of the blues: "al mal tiempo, buena cara”; "canta y no llores” and other typical Cuban phrases all refer to the idea of “laughing just to keep from crying.” This song really helped us face some dark and difficult years here in Cuba during the Special Period. And for me personally during this concert it helped me more than ever to handle some of the tough emotions that I was feeling throughout the night. The original author put his wife’s name in one verse asking her to “hand him a candle” and years ago, when I first started singing this song, I changed the name to personalize that intimate scene. So during this concert, when people heard me say that there was someone missing in the audience that night, everyone present knew that I was referring to the person who was my partner for over 44 years. She was an actress who was very well loved in all of Cuba and all of those of us who knew her were still feeling the pain of her recent physical disappearance. I was so emotional that when it came time to do this song, I don’t know how I was even able to play the guitar. I’m not a religious man and I don’t believe in ghosts, but that night I felt that she was right there with us on stage. And I know that Adria Santana will always be with me and will always be alive in my heart.